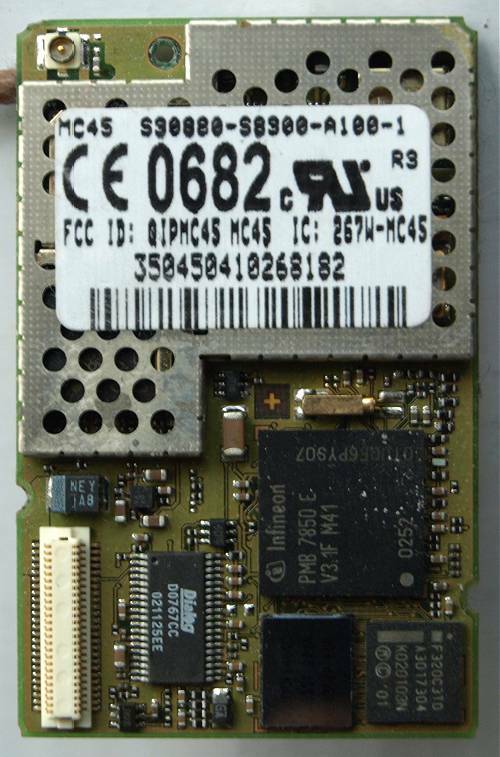 Vehicle tracking by GPS typically requires an electronic module installed in the vehicle which contains an embedded computer system which obtain position fixes from GPS satellite signals, and a radio system to communicate with a headquarters, where a base station can be used to receive and plot the tracking data. Shown here is a commercial MC45 module by Siemens AG, which dates back to 2002. This was 53 x 34 x 3.5 mm in size, weighed 10g, and used an external antenna. A contemporary module in 2016 can be as small as 4mm square by 2mm thick, and modules integrated with an antenna can be 10mm square by 4mm thick. I contributed both hardware and software design, starting in 2001, to an implementation of such a system. This involved writing the firmware for the electronic module installed in the vehicle (known as a data processing unit or DPU), and software to run on a PC or server to communicate with the vehicles and log the data for front end processing. The most well-known global satellite navigation system today is the GPS ("Global Positioning System"). Its roots go back to the early 1960s, when the US Navy set up Transit, which was a satellite navigation system considerably less accurate than GPS, with nominal accuracies of the order of 100-200m. Transit navigation services ended on December 31, 1996. In the summer of 1973, the Defense Navigation Satellite System emerged as a plan to satisfy the needs of all US Services. This was merged with the Navy's Timation navigation system to become Navstar (Navigation Satellite Timing And Ranging), which became more commonly known as GPS. "By the turn of the century, a single system - Navstar - may serve most of the United States' global navigation and position-determination needs. Although, right now, it's a military system, the Navstar Global Positioning System (GPS) has shown its worth in a variety of civilian uses: maritime, aviation, and space. If Navstar is eventually adopted for U.S. civilian use, it will provide for the first time a common system for all classes of users, and it may reverse the proliferation of special-purpose navigation and positioning systems"
Quoted from a print copy of "Spectrum" in my possession. Back in 1981, the lowest estimated price for an austere GPS set was about $2500, and high-performance civilian GPS sets were priced from $30000 to $45000. Today, the functionality of what was then considered high-performance is available, with added functionality from embedded processing and mobile GSM communications, for considerably less cost. The GPS system is described in terms of the three parts known as the Space Segment, User Segment, and Control Segment. The Space Segment consists of a number of satellites orbiting the Earth at altitudes of 19200 nautical miles, and these satellites follow a track that repeats every 12 hours. The Control Segment is the set of monitoring and control stations that look after the operation of the satellites and ensure that they maintain accurate timing and position information. The User segment consists of every user that receives signals from the satellites and uses those signals for timing and/or geolocation. Users can download the Almanac from the Space Segment; this provides orbital model data that allows the user's equipment to obtain initial estimates of which satellites may be visible in the sky. Precise data about the positions of the satellites is obtained by downloading the ephemeris data (which is updated frequently), which when combined with the almanac (which does not change very often, and hence does not need to be downloaded frequently) establishes in the user's receiver a basis for calculation of the user's position. The user equipment also needs to measure the timing for signals received from each satellite. Given the time delay between each satellite, whose position is known, then the user equipment can calculate the user's position on the ground. Nowadays, all the reception of GPS signals and calculation of positions is usually performed by a self-contained receiver module which is incorporated into the user equipment. The raw GPS information is made much more useful by the addition of supplementary processing and communication capabilities. For example, the location information may be displayed together with a map from a database on a display screen. The GPS data may be retrieved remotely via a radio link, permitting remote vehicle tracking and location of property. The equipment might store records of GPS locations, allowing the periodic downloading of travel histories. The equipment might also permit the monitoring of inputs such as signals from a vehicle alarm unit, and remote control of outputs such as warning lights and immobilisers. Advances in technology have enabled the unobtrusive installation of complex electronics such as GPS vehicle tracking receivers in a wide variety of vehicles and other mobile platforms. For installation, the vehicle tracking receiver requires a power supply taken from the vehicle, and an antenna mounted with a clear view of the sky. 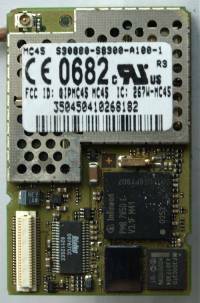 For cars and trucks this can usually be accomplished without any overt indication that the vehicle tracking receiver is installed. Almost anything that moves or can be moved can now be considered for tracking by GPS. The key factors for consideration are whether the potential loss of items (by theft, or simply losing track of where a vehicle or asset has been left in a large organisation) or inefficient use of items in terms of movements and timing can contribute significant losses compared with the situation in which complete information is available about the location and movement of items. Let's assume you can receive signals from one satellite. The time of flight of the signal, accounting for the speed of light (radio waves) and corrections for the effect of the Earth's atmosphere, tells you the distance from the satellite, which puts you on the surface of a sphere. The snag is that you don't have a timing reference for the satellite's signal, so you need an additional satellite to set your local clock and determine the difference between the clock and the satellites. Bearing this in mind, the following argument based on knowing the distance from a number of different satellites applies, but you must add one satellite for the number required (denoted by the number in brackets) because in practice you do not have absolute time information and must obtain it indirectly by measuring multiple satellite signals. You can see from this that in an ideal situation, 5 satellites should give an unambiguous position and time fix; 4 satellites will give a point fix that is usually pretty good because one of the points will be way off in space; 3 satellites will give an approximate location if the position has previously been established, since the intersection circle could itself intersect the Earth's surface at two possible points. In practice, there are errors inherent in the measurement process which means that the position fix is subject to an uncertainty which is reduced as the number of satellites is increased. Information about the number of satellites used in a position fix, the likely uncertainties, and the way in which the data has been calculated, is an important part of the result delivered by a GPS receiver and hence this supplementary information should also be obtainable together with the fix itself. An overall flag is usually provided that indicates whether a fix is currently acceptable or invalid. Modern vehicle tracking has its roots in the nineteenth century, when the spread of the railway in Victorian Britain became closely linked to the development of the electric telegraph, which was used for control and communication to manage the distribution of trains on track segments. In 1837, Cooke and Wheatstone developed the electric telegraph which used an electric current to move magnetic needles and thus transmit coded messages. The first operational telegraph system linked Euston station and Camden town. Telegraph machines appeared in post offices, and it became possible for a driver of a horse-drawn or early motor vehicle to send a wire reporting his arrival at a destination. At the end of the nineteenth century, several independent demonstrations of radio transmission were made, and by 1906 it was possible for the Clark Portable Army Set to be used for radio links between mobile units in the field, transported on the backs of mules. Subsequent twentieth-century developments in space satellite science, high stability electronic clocks, semiconductor microelectronics and digital computing have enabled the automatic position location and radio link technology in the form of modern GPS vehicle location systems. Many early efforts in vehicle tracking were aimed primarily at theft-prevention for high-value loads, and tracking vehicles of expensive marques. Improvements in technology and reduced costs have allowed it to develop into a comprehensive tool for fleet management and expanded the number of ways in which the vehicle tracking technology is used, so that it is possible for such systems to pay for themselves by reducing mileage and fuel costs, which can be tracked by the system, as well as by increasing vehicle utilisation and fleet productivity. Vehicle tracking systems for fleet management let you know where your vehicles are or where they have been, so that you can best plan and manage their future movements. Vehicle tracking techniques range from the immediate real-time live tracking that lets you know where your vehicle is at each instant, to periodic vehicle tracking or positioning updates which may be provided by updates of vehicle position every so often, usually within a number of minutes. Often a system will allow vehicle tracking updates to be made at pre-set times, on demand, or conditional on certain events occurring, such as a delivery being made. Generally the more often vehicle tracking position is updated, the costlier it is. The cheapest option is not to transmit the vehicle tracking data at all, but download it directly from the vehicle when it returns to base, providing a historical log. A vehicle tracking system company will usually also provide fleet management software applications that bring together the vehicle tracking information of the whole fleet and log travel history, calculate fuel consumption etc. The US Government's GPS system is free to users and has been around for the longest time, so is the most popular for fleet management companies to do their vehicle tracking. The GPS satellites were deployed originally for military use, but their signals were made available in downgraded form for commercial users, which number in millions worldwide. In GPS systems, operators do not have to pay for the vehicle position fixes provided by the GPS satellite systems, but they do have to pay for the GPS receiving unit, antennae, and the radio link used to transmit the vehicle tracking data, which may incur costs in using the radio network. The Eutelsat satellite-based positioning system also used for tracking vehicles differs from GPS in that it is a privately run operation, and users are charged for satellite usage. GPS used to be accurate to within 100 metres, but in May 2000 the US Government removed the downgrading known as "selective availability", which improved accuracy to about 20 metres or better. A technique known as differential GPS allows 1 metre accuracy or better by using a ground-based reference signal, although this is normally used for survey applications rather than vehicle tracking. Suppliers of GPS-based vehicle tracking systems provide on-board receivers that decode high-frequency radio signals emitted by the satellites, and correlate the timing between different satellites, and thereby allow the vehicle tracking system to determine its longitude and latitude, as long as at least three satellites are receivable. To show the location geographically, the latitude and longitude data from the mobile vehicle tracking system is converted to a symbolic overlay on software that shows a map of the surrounding area. This software may run in the vehicle itself, as in on-board sat-nav dashboard systems, or for a fleet management system on a computer display at the fleet base, where the fleet manager monitors the positions of all vehicles in the fleet. Vehicle tracking can utilise, not just satellite (e.g. GPS), but also digital cellular telephone networks and low-frequency radio networks. The means by which the tracking information is transmitted back to base may include digital mobile radio networks, private mobile radio systems, and satellite networks. The radio network may interface with land-line, internet or ISDN links to the base. Cellular mobile telephone networks can also be used to do position fixes by locating vehicles within a cell site, i.e. showing where the vehicle is in relation to the nearest cell site base station. Accuracy varies, depending on the density of cells (there are more cells in towns than in rural areas). When the base system has captured the data from each vehicle, and it is available on a base station computer, it is then possible to use the Internet to allow users to follow the vehicle tracking information and carry out fleet management from any computer, laptop or handheld device with an internet link. "The journey, not the arrival, matters." - T. S. Eliot. Robert P. Denaro, "Navstar: the all-purpose satellite", IEEE Spectrum, May 1981. Vehicle Tracking Systems - Are they for you? Remote vehicle tracking in a Developing Country?